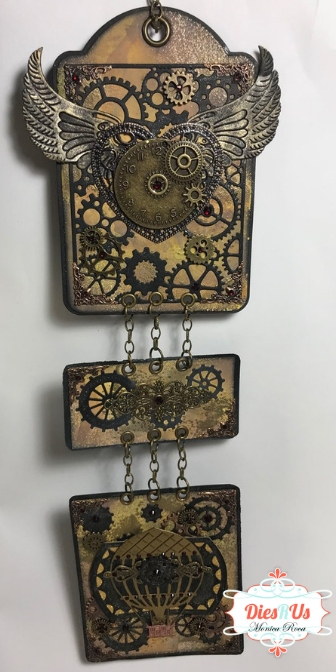 I am back on the blog today to share a grungy steampunky wall hanging with you. I always seem to forget how much fun I have when I play with distress inks and distress oxides. I had so a blast creating this.All of the products used will be listed below as well as a quick youtube video where I go over all of the products used as well as all of the details of my project! As a quick reminder ALL Cheery Lynn Design dies are currently 40% OFF! So if you don't have any or have a few in mind head on over to the store and pick them up before they are all gone! Thank you so much for stopping by & happy crafting!! WOWZA! This is an awesome project. I'll stop back when the video is working properly ... can't wait to see how this was done. Thanks for inspiration! THis is an absolutely amazing project! Way to go! Excellent inspiring project! What a Great Wall hanging piece with such awesome grunge work. Thx for the fab ideas Teamie! Fabulous wall hanging! Love the look!